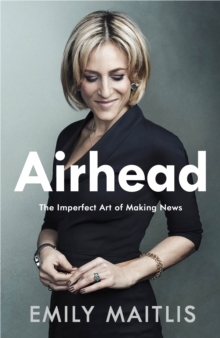 'A WONDERFULLY SANE BOOK FOR OUR UNHINGED TIMES' Simon SchamaPre-order the insightful, hilarious and engrossing memoir from one of our most eminent TV broadcasters, Newsnight's Emily Maitlis, as she takes you behind the scenes of the biggest news stories in recent years. ___________The things that are said on camera are only part of the story. Behind every interview there is a backstory. How it came about. How it ended. The compromises that were made. The regrets, the rows, the deeply inappropriate comedy. Making news is an essential but imperfect art, and it rarely goes according to plan. I never expected to find myself wandering around the Maharani of Jaipur's bedroom with Bill Clinton or invited to the Miss USA beauty pageant by its owner, Donald Trump. I never expected to be thrown into a provincial Cuban jail, or to be drinking red wine at Steve Bannon's kitchen table or spend three hours in a lift with Alan Partridge. I certainly didn't expect the Dalai Lama to tell me the story of his most memorable poo. The beauty of television is its ability to simplify, but that's also its weakness: it can distil everything down to one snapshot, one soundbite. Then the news cycle moves on. Airhead is my step back from the white noise. Before and after the camera started rolling, this is what really happened. ___________'Smart, funny and brilliantly told stories about what goes on behind the scenes of television news. A joy' Elizabeth Day'Revelatory, riveting and frequently hilarious. A joy from beginning to end' James O'Brien'Emily has a style that would make you enjoy her report on the end of the world.